In order to properly celebrate Christmas, there are three specific gifts that one must have. These have always been given since the very first Christmas and the wisest among men will continue to offer them, not only in this season, but all year long. Gold is the first gift, a symbol and recognition of His kingship and divinity. Like the divine nature of Jesus, gold never tarnishes – it always maintains its purity. Because of this, gold is considered highly valuable. Also, gold endures where other elements would decompose when "attacked". No single acid can dissolve it. Silver can be dissolved by nitric acid, but not gold. Thus nitric acid was used as the original "acid test" for purity. We offer our "gold"—the things we value the most in this world—for the untarnished and incorruptible gold of Jesus who is our divine mediator. He is our King and our God. Frankincense is the second gift, a symbol of Christ's priestly work in atoning for sin. Incense was an important element of worship for Israel. Given the nature of animal sacrifice, the stench of death could be overpowering in the temple. The burning of frankincense would provide a pleasing aroma, covering the smell of sin and death. It is offered to God, symbolic of the prayers of repentance and requests of forgiveness. 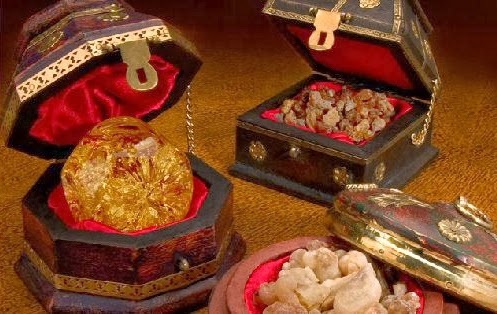 Frankincense only worked when it was burned – made nothing. We remember that Jesus made Himself nothing by humbling Himself to become man so that all men may live. We offer up our sins – with their smell of death and corruption – to Him in exchange for His pleasing aroma before the Father. He is our high priest, consumed so that He may cover our sins with His blood. Myrrh is our last gift, a symbol of Christ's death for us. The word myrrh derives from the Hebrew word for bitter. Used throughout the ancient world as an embalming fluid, myrrh was usually created by combining the resins of two different plants. Jesus had combined His divine nature with a human one for the express purpose of dying for humanity. As a fragrance, myrrh reacts differently than most resins in that "it expands and 'blooms' when burned instead of melting or liquefying. "1 Jesus' death allowed His salvation to expand across the entire world. Myrrh was also used as an antiseptic medicine (re: Smyrna) to promote healing. I pray that you and yours will have a blessed Christmas this year – and that you won't forget to put the three most important gifts on your list. You see, these really aren't gifts from us. These are gifts to us, and a greater gift no man has known than the gift of Jesus.